Just 22 players bagged up stacks on Day 2 of Event #22: $1,000 No-Limit Hold'em at the 2015 World Series of Poker. 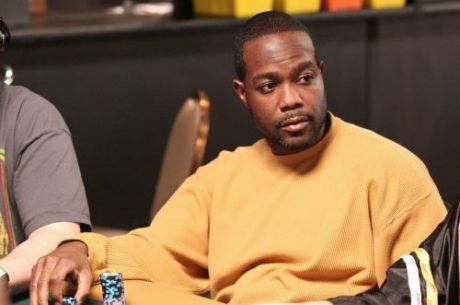 One player still in contention for the $318,977 first-place prize is a name fans of old-school World Poker Tour broadcasts might recognize: Paul Darden. In Season 1, Darden won a $3,150 WPT event at Lucky Chances Casino in San Francisco for $146,000, an impressive triumph considering the final table included future TV superstars Antonio Esfandiari (third place) and Phil Helmuth (fourth place). Darden, who had already won a bracelet back in 2001 in a seven-card stud event, proved he was no flash in the WPT pan with another final table. This time, he took fifth in the $10,200 Party Poker Million IV for $300,000. That limit hold'em event was won by Mike Gracz. On one of the last breaks in Day 2, PokerNews caught up with Darden, who eventually finished the night with 433,000 in chips, good for ninth place in the counts. He filled us in on what he's been up to. "I've just been taking it easy, getting back on my feet," said Darden, who was using a motor scooter to get around the Rio. Darden was diagnosed with multiple sclerosis (MS) at a recent time he wouldn't specify. The incurable nerve disease has left him using a scooter to get around the Rio much faster than he can walk. "I had a little relapse, a scare," he said. "I've had to go through all that, seeing doctors, and doing a whole lot of reading." That's behind him for the moment, though, and he's optimistic that better times are ahead. "They put me on some new medication and I'm better," he assured us. "Everything's on the up now. God gave it to me because he knows I can handle it." He opined that the ups and downs of life mirror the ups and downs of poker. Having gone through the swings he'd had in life lately, the swings on the felt are easy by comparison. Those are skills he's putting to use again. A career tally of more than $2.2 million in tournament earnings dating to 2000 marks Darden as a player who has experienced his share of success in the poker world. But an overwhelming majority of those cashes came more than five years ago, and Darden admitted there's been a period of adjustment as he eases back into a changed game. He's been putting in sessions back in his home state of Connecticut, a state in which he ranks No. 1 on the all-time money list. "I'm getting an understanding of today's poker world," he said. "It's so much different. Everybody, for the most part, has the same information. Therefore, it's harder to steal and it's harder to win, so you have to readjust your game." At the same time, he said, the basics remain the same. It's about getting it in good more than you get it in bad. It's about reading people, finding their tells, and figuring out how they're approaching the game. The adjustments have already begun for him, but he wouldn't let on what he's gotten figured out thus far. "I could, but I'm not giving it away," he said with a chuckle. "Everyone's too smart, there's too much education. You're gonna have to pay for it." He plans to play a selection of tournaments while he's in Las Vegas for the summer, staying throughout the WSOP. He's dreaming big, and when it's all over, he might let his secrets out, for a price of course. "After I win seven bracelets this year, I'll put it in a book," he declared. "Starting with this one."